Recorded on the seashore of the uninhabited island called Narugashima in the Hyogo Prefecture, where stiff winds blew intermittently. The sustained low-pitch sounds come from the ferries passing each other off the coast. 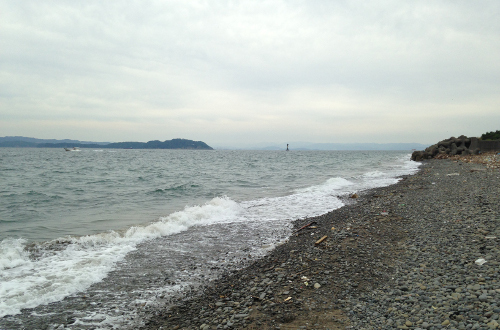 Recorded on the Kehi no Matsubara, a quiet and scenic beach with many pine trees. You can hear the seagull screaming and people chatting while strolling. 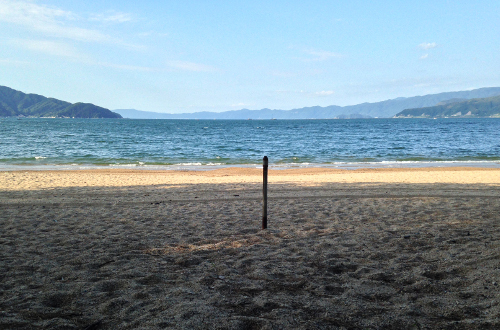 The beach is located at the foot of the Tsuruga Peninsula where seven nuclear power plants are currently in operation. Recorded at the Nodagawa Shinsui Park in Yosano-cho, Kyoto Prefecture. 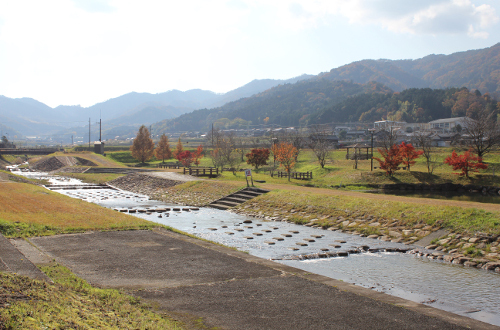 Yosano-cho is a rural town on the alluvial fan surrounded by the mountains; the park itself is located along the Noda River. Recorded near the 1,200-year-old Camellia tree (Camellia japonica, ‚Kurotsubaki‘) located deep in the valley in Yosano-cho. The height and branch spread of the tree is about 10m, presumably one of the biggest and oldest of its kind. Recorded in the morning at the Kaetsu Soho Park located half way up Mt. Oeyama in Yosano-cho. Nature and objects on the mountainside fade in and out as the place where the sunlight shines gradually changes. Hegurajima is a small island located in the Sea of Japan at the far north of the Ishikawa Prefecture. 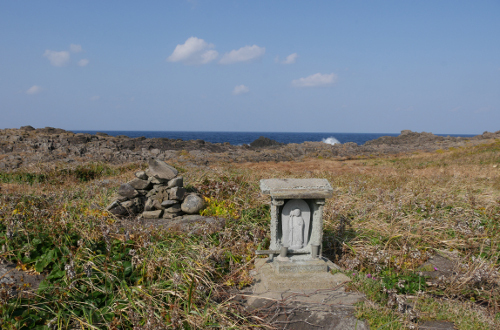 There are various small shrines and cairns on the island. I set up the harp near the Yasaka shrine in which the god of epidemic prevention is enshrined. Kinshozan is a small mountain located in Ogaki, Gifu Prefecture. The mountain is famous for its abundance of fossils like corals, bivalves and snails which inhabited it about 250 million years ago. People started exploiting its high quality limestone and marble during the Edo period, and the mining-activities are still going on today. I set up the newly-made harp at the watchtower of the mountain where I could see the whole mining area. The intermittent sounds come from the drilling of rocks under the cliff. All the recordings are unprocessed field recordings using Aeolian Harps of our own making. Recorded in the Kyoto, Hyogo, Fukui, Ishikawa and Gifu prefecture, Japan from September 2014 to November 2017. Wind Deities – Eisuke Yanagisawa it was who used a bat detector to create an interesting record of bat-frequency sounds around 2011 or 2012. Now this Japanese film-maker and researcher has made Path Of The Wind (GRUENREKORDER GRUEN 182), a lovely record featuring the sounds of the Aeolian harp, also called the wind-harp. Long a favourite with people who love the weather and the environment, these devices (not much more than a resonating box and some strings to be blown by the wind) have a history going back to the 17th century and have even featured in classical composition and poems from the romantic era. Eisuke has built his own models, positioned them in various parts of Japan over the last few years, and gathered in the enclosed recordings. In the sleeve notes, he expends a paragraph or two explaining the precision of his thinking as regards optimal microphone placement, which is but one of many indexes to the thoroughness of his thought and execution; I have no doubt it extends to all of his projects. Some of the recordings allow background details, like the cry of a seagull or a passing ferry, to glide into the picture, and other pieces refer to aspects of the landscape, such as an ancient tree or the “ridge line”. Mostly it’s this gorgeous natural unobtrusive drone sound, moving at an unhurried rate, which is guaranteed to induce feelings of inner calm and fulfilment without being tarnished by soppy “new age” ideas about healing and relaxing. The locations are photographed and annotated, in highly concise form; at one time, this label used to spend a lot of money on production of colour booklets of images and notes, but perhaps Eisuke Yanagisawa is just naturally a person of few words. Very good. The Aeolian harp is a stringed instrument – usually hand crafted – which produces a range of harmonic tones when wind passes across it. It has a long history – imbued with romanticism and mysticism – stretching back to antiquity, from where it derives its name from Aeolus, the Greek God of the wind. For Path of the Wind – Eisuke Yanagisawa’s third record for Gruenrekorder – the Japanese film maker and field recordist constructed his own Aeolian harp, mounting two microphones into its sounding board. He then recorded the tones produced at a variety of locations across Japan. 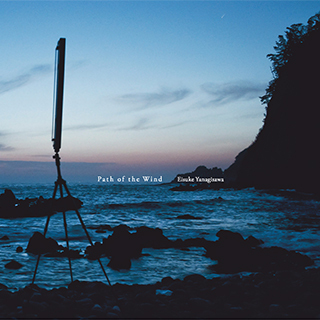 Mirroring the investigatory style of his work as an ethnographer, Yanagisawa has given these seven pieces simple descriptive titles denoting either the location of the recording – Hegurajima, In a Park – or some element particular to the sounds, for example Seagull and Ferry Passing. The latter piece opens the record and we are immediately confronted by the strange otherworldly harmonics of the harp, which are a world away from the familiar plucked sound of a traditional harp. the sound is something like a combination of feedback harmonics and pure sine tones which vary in intensity and frequency depending on what the wind is doing. On Ferry Passing the microphones mounted on the harp also pick up sounds of waves breaking against the shore of the uninhabited Narugashima island where the harp was placed. Seagull, titled after the bird which makes a cameo appearance continues the shoreline theme, this time at a busy beach. The harp is more muted here, emitting a range of lower frequency metallic sounds which leave space for the sounds of passersby, the waves and the aforementioned seagull, which the harp almost seems to respond to; raising its pitch and volume as it passes overhead. Being entirely dependent upon natural wind power for its sounds lends the Aeolian harp a romantic, even spiritual quality that has inspired many literary works. Coleridge dedicated two poems to the instrument during a period when the harp was a common household instrument in more affluent circles. The idea of an ancient natural or mystical music coming through the instrument has inspired many an interpretation upon the harp. There are several monumental versions of the instrument located at sites across the world. 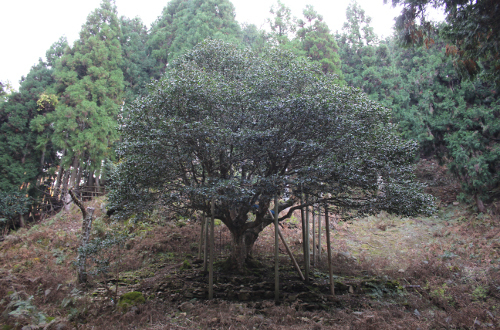 Yanagisawa may be tapping into some of this antiquity on Old Camellia Tree which locates the harp near a 1200 year old tree, deep in the Yosano-cho valley. The wind speed down into the valley must have been steady as the harp intones consistently, wavering and hovering around the mid range with minimal variation, mimicking the tree’s eons of slow growth. Ridge Line, in contrast, displays more variation as the harp is given almost exclusive pride of place in the recording. There are sharp peaks and troughs in the volume and tone of the harp as gusts of wind pass across its strings. There is little background sound of the environment halfway up Mt.Oeyama, which sounds like quite a remote windy place. Yanagisawa says it took a lot of trial and error to get the harp to produce any sound at all. Varying the string materials, as well as finding the optimum angles to place the instrument, eventually yielded the results we now hear. The last two pieces are the longest, each at over seven minutes. The extended length affords the listener more time to appreciate the extraordinary range in harmonic texture produced by the harp. On Hegurajima the progression of the sound and the way it artfully shifts across different tonal registers suggests some alien composer at work. It’s hypnotic, not owing to any rhythmic element or sustained meditation on a single frequency, but rather the effect is like watching flames, or the way water flows around rocks in a stream. The harp is a mediator of natural processes, rendering them into a language we might better understand. It seems appropriate then that on Hegurajima the artist located the harp next to shrine of a God, in this case the God of epidemic prevention. The final piece Kinshozan leave us with thoughts about nature and the passing of time. 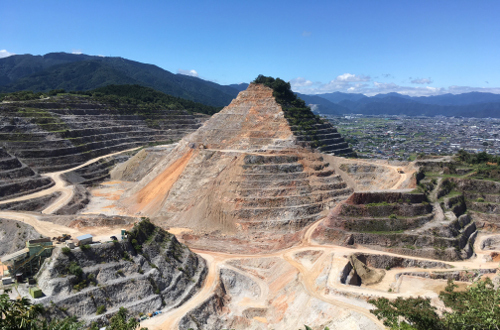 The harp was placed at the watch tower on the mountain of Kinshozan, around which many fossils are located and mining for limestone takes place. Limestone of course is made from the millions of years old remains of marine organisms. We can hear the faint sounds of machinery at work below as the harp tones glide, from one harmonic texture to another. Music of the eternal wind bears witness to the harvest of time’s bounty. Every six months or so, new items appear on Lasse-Marc Riek and Roland Etzin’s Gruenrekorder imprint that present innovative treatments of field recordings-based work. Three recent projects exemplify the imaginative sensibilities artists bring to the label’s output, in this case releases by Eisuke Yanagisawa, Gregory Büttner, and Michael Lightborne (all three are available in digital form, the first two also as CDs and Lightborne’s in vinyl). As an indication of the breadth of the label’s projects, Yanagisawa’s Path of the Wind focuses on sounds generated by the Aeolian Harp, a string instrument ‘played‘ by nature, whereas Lightborne’s Sounds of the Projection Box has to do with ambient sounds originating from UK-based cinema projection booths. Each of the three releases fascinates in different ways. 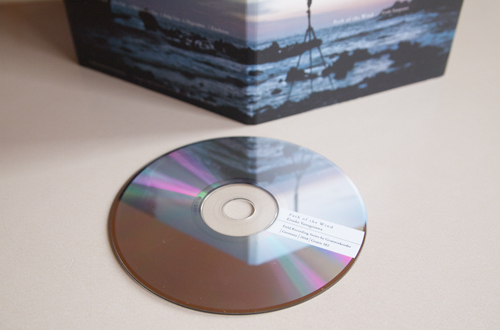 The forty-one-minute release by Yanagisawa, an ethnographer, field recordist, university professor, and filmmaker based in Kyoto, provides a remarkable illustration of the music-generating capacity of a natural element, in this instance wind. To explore the phenomenon, he first built a small Aeolian Harp using materials from a local store and then brought it outside to test it out; when no sound resulted, he adjusted the string materials and tension until a better outcome was achieved (two microphones were also adjoined to the harp to record the sounds produced). Delicate harmonic textures are generated that modify according to alterations in wind direction, strength, and consistency. 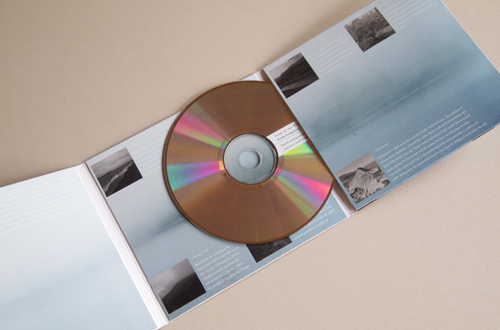 Based on unprocessed field recordings recorded between 2014 and 2017 in different parts of Japan, Path of the Wind presents seven settings of subtly contrasting character. When the harp interacts with the surrounding area, it becomes a transducer in the way it picks up environmental sounds; in the opening piece, for example, the reverberant, hollowed-out tones of the harp merge with low-pitched shimmer and warble originating from nearby ferries passing each other. When in the subsequent track the piercing cry of a seagull appears amidst the mutating drone of the harp recording and the sound of waves crashing ashore, it can’t help but startle. In general, the wind tones produce a sound reminiscent of the ebbing-and-flowing hum of electrical wires, which makes for a stark contrast when heard alongside the burble of a water source or bird cry; the final setting, “Kinshozan,” even introduces an eerie, sci-fi dimension to the release, despite the fact that the title refers to a small mountain and the tiny clattering sounds derive from drilling at a nearby mine. Yanagisawa’s sound portraits are sometimes so lulling, it’s easy to lose sight of the fact that much of what’s presented are undoctored documents of nature’s handiwork. Eisuke Yanagisawa to japoński etnograf, scenarzysta i filmowiec z Kioto. Swoją uwagę skupia na słuchaniu i rejestrowaniu brzmień oraz rezonansów z poszczególnych miejsc, a także na odkrywaniu dźwięków z perspektywy kulturowej, ekologicznej, geograficznej, akustycznej i historycznej. Proces ten obejmuje obserwowanie i rejestrowanie małych, ukrytych i niesłyszalnych dźwięków przy użyciu różnych typów mikrofonów. Od wielu lat Yanagisawa interesuje się kulturą gongów mniejszości etnicznych zamieszkujących Centralne Wyżyny Wietnamu. Nagrania z „Path of the Wind” powstały między wrześniem 2014 a listopadem 2017 roku w prefekturze Kioto, Hyogo, Fukui, Ishikawa i Gifu. Materią, która posłużyła do wygenerowania dźwięków, okazała się harfa eolska stworzona dodatkowo przez samego Yanagisawa. Wystawiał ją wielokrotnie na wiatr, lecz początkowo nie przynosiło to żadnych efektów. Musiał przerobić pewne elementy konstrukcyjne aż w końcu zaczęła grać, ponieważ harfa rezonuje z otaczającym ją środowiskiem. Do każdego z dwóch otworów włożył dwa mikrofony, aby wyraźnie nagrać rozunujące dźwięki, ale bez zbytniego wpływu wiatru. Jak sam przyznaje artysta, używa harfy jako pewnego rodzaju przetwornika czy też brzmiącego ciała. Zaskakująca złożoność harmonii o kształcie ambientowych fal, mikrodźwięków / -dronów oraz drobnych sprzężeń wprawia w trans, tym samym zapraszając nas do innego kontaktu z odgłosami natury, bliższymi dźwiękom wszechświata. „Path of the Wind” znakomicie się sprawdza powiewając na pograniczu jawy i snu. 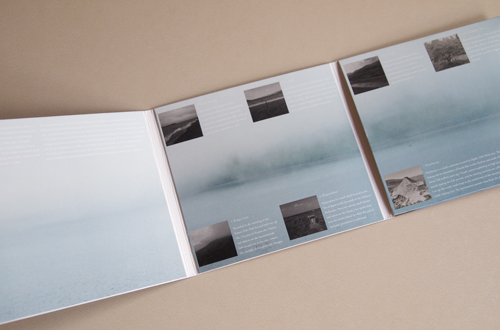 Le label allemand Gruenrekorder a bâti sa réputation sur une sélection exigeante et originale d’enregistrements de terrain – field recordings – répartis en trois séries de CD ou de vinyles : field recordings purs, soundscapes et sound art, marquant la progression de l’implication humaine dans le produit sonore final. La première série, à vocation principalement documentaire, héberge cette fois un disque de l’artiste japonais Eisuke Yanagisawa qui aurait pu aisément se placer dans l’une des deux autres tant les qualités harmoniques qui le parcourent sont manifestes. Pourtant… pourtant, formellement il s’agit de field recordings purs, intouchés, « unprocessed » nous affirme Eisuke Yanagisawa. Il faut dire qu’il a concentré ici des pièces réalisées autour d’une unique mais riche matière sonore : le vent. Une harpe éolienne de sa propre fabrication, tendue dans divers lieux qui intitulent chaque pièce, munie de micros sensibles, et le registre d’un vent changeant, aux directions, forces et intensités variables, s’ouvre pour quelques dizaines de minutes. Les harmoniques, le drone – sans conteste – les subtiles atténuations de la luminosité créent dans la représentation musicale du vent une seconde respiration. L’amplitude, du souffle ténu à la concavité métallique impétueuse, dessine un paysage aussi changeant dans ses spires que dans les crêtes, arbres ou habitations qui les décorent (de loin en loin, des sons des différents environnements qu’Eisuke Yanagisawa a élus viennent festonner discrètement la trame vibrante et miroitante, oiseaux, ferry, amalgamés à ce fredonnement primordial comme le coup de dent contre la langue). J’ai vu et entendu bien des musiciens qui, avides d’une forme élégante aux frontières de la texture, rendent à l’aide de gongs, de cordes, de lames de bois, de laptops, l’image sonore d’une musique en éclosion en tout point pareille à celle-ci. Car il faut bien l’admettre, si le musicien des bourdons s’aventure parfois aux abords de la grille fondamentale et parvient à y demeurer artiste, maître de son geste et dompteur de la forme sonore primordiale, celle-ci, à son tour, s’en approche quand elle est prononcée de l’autre côté de la fine paroi, par les gisements de musiques premières que sont l’eau ou le vent ; alors la confusion est totale, et la conformité à s’y méprendre. J’ai, il y a plusieurs années, consacré un numéro entier de Fear Drop à l’esthétique musicale du vent. Je n’ai pas peur d’employer pour le vent cette épithète, musicale, d’autant que j’insiste fréquemment sur la séparation entre documentaire et musique. La musique que rapporte Eisuke Yanagisawa n’est pas encore celle de l’Aeolian String Ensemble de David Kenny qui retraita admirablement les sons de sa propre harpe éolienne dans un élan mélancolique et romantique mesuré sur deux disques, mais elle sent encore le bois et l’humus, le roc et le fer, comme une mise au jour du geste poétique que Jean Giono, dans Le Serpent d’étoiles, décrit avec la mélopée quasi tellurique de la harpe éolienne tendue au pin lyre par les bergers. Un geste comme un porte-voix : l’artiste japonais nous apprend que sa harpe a dû être modulée plusieurs fois pour « sonner », qu’ensuite il lui a fallu trouver chaque fois la bonne place, l’orientation convenable, suivre le chemin du vent. Il y a ici, incontestablement, une première intervention, qui descend plus loin que le simple cadrage. La musique du vent, soit, mais avec un traducteur amplificateur de talent : à la charnière donc, et précisément, entre l’indistinct et le geste artistique, qui déjà articule l’émotion. Yanagisawa crafted a homemade Aeolian harp, then took it to various locations where it interacted with the environment, natural and manmade. The harp created the eerie, quavering tones that these instruments tend to do and both blends in and offsets the surrounding sound-world very effectively, whether that world is made up of low horns of passing ferries, waves and seagull cries, drilling from a local mine or much subtler contributions. The minute fluctuations in the character of the harp are quite intriguing as are the various environs and the interpenetration of the two. Yanagisawa evinces great sensitivity in his choices. While perhaps more over than, say, Toshiya Tsunoda’s recordings, fans of his work will find much to enjoy here. Der japanische Filmemacher und Feldrekorder Eisuke Yanagisawa trat in der Vergangenheit bereits mit Aufnahmen in Erscheinung, welche einen Teil des Ortes, an dem er seine Technik installiert hatte, einfangen sollten. In einer dieser Aufnahme, »Ultrasonic Scapes« (2011), wurden den Menschen umgebende, aber mit freiem menschlichem Gehör oft nicht wahrnehmbare Klänge, wie das Surren von Zikaden, das Rufen von Fledermäusen oder auch das Brummen von Ampeln, mit Hilfe eines Ultraschallmikrofons zum Teil verstärkt, dokumentiert. Auf »Path of the Wind« bedient er sich selbstgebauter Äolsharfen, das sind Saitenkonstrukte, die, vom Wind angetrieben werden und von selbst – je nach Windstärke und -richtung – ein hohes Leiern oder Dröhnen fabrizieren. Das Mikrofon wandelt dann den Wind in die Töne des Instruments um. Doch auch die für Japan so typischen Alltagsgeräusche, etwa Meeresrauschen mit Seevögeln, spazierende Menschen, eine ankommende Fähre oder am Schluss des Albums die Arbeiten in einem Steinbruch, an dem Yanagisawa Station macht, scheinen in den Aufnahmen durch. Dort ist es besonders windig, und dementsprechend sind die Drones von einer hohen Intensität, man spürt den Wind über diese besonderen Orte und Szenerien hinwegfegen und ihre jeweilige Essenz über die Saiten fegen und sich verdichten: eine über 1.200 Jahre alte japanische Kamelie in Yosano-cho, ein Strand, ein Park oder sieben in der Nähe befindliche Kernkraftwerke. Die Harfe wandelt all das Leben in Betrachtungen des Ortes um, ihrer spezifische Ökologie, Geologie und ihre Geomorphologie. Nach Vorschrift des Labels sind diese Aufnahmen gänzlich unbearbeitet. Yanagisawa ist also weniger Musiker als vielmehr Dirigent oder Kurator. Er stellt das Instrumentarium und wählt aus, lässt die Natur ihre Lieder singen. […] EISUKE YANIGASAWA ist in Kyoto ein Fieldrecorder, der wie mit der Wünschelrute zwar nicht Wasser, aber doch dessen Klänge gesucht hat („Scenery of Water“). Bei „Ultrasonic Scapes“ hat er Fledermäuse, Zikaden, automatische Türöffner und Straßenlichter belauscht oder Furin Bells. Der Wind spielt nicht nur diese feinen Glockenspiele, die Kühle suggerieren, er harft nun bei Path of the Wind (Gruen 182) auch auf Yanigasawas Aeolian Harps. Dabei nimmt der Japaner bei seinen Fieldtrips und Windscapes Beifang mit auf: das Fauchen des Windes, das Brummen von Fähren vor Narugashima, das Krah-krah-krah einer Möve am Strand von Kehi no Matsubara, die rauschende Krone einer Camellia japonica, die vage Atmosphäre von Parks, die noch vagere Aura eines Schreins, die ferne Klangkulisse des Kinshozan-Kalksteinbruchs bei Ogaki. Der Wind erzeugt summende Schwellklänge, tönend changierendes Vibrato wie von einem sanften Donnerblech, Flötentöne, die leicht an eine Shō erinnern, an ein Theremin oder an den dröhnenden Nachhall einer Steelpan oder Hang. Im Grunde ist der Klang aber schlicht einzigartig. The unprocessed field recordings of Eisuke Yanagisawa were made all around Japan (2014-17) using Aeolian Harps (a stringed wind harp). On his fourth solo record since 2009, Path of the Wind includes seven tracks with a run time of over forty minutes, each named after their location or single subject as titled. Kyoto-based Yanagisawa is an ethnographer and filmmaker as well. The recording begins with Ferry Passing. It’s amazing to think that he is basically placing the instrument, in-situ, and it is able to channel the air and natural environment in this way, with only the sounds of the un-manned instrument and the nearby surroundings. It’s a wondrous, peculiar warped processing of waves that sounds more like an alien space craft is arriving, rather than a ferry. I’d imagine he selects settings that are somewhat uninhabited and as remote as possible to channel the undisturbed place, only emitting the circulation of open air. We are still on the sea once his Seagull begins. The atmosphere is sparse as the bird makes its call and the water laps back/forth, the harp captures the radiance and curve of the wind. It’s a spectacular wave in and of itself amid the foamy waters. It ranges from harmonic to atonal but remains moving as if its drawing its austere acoustics, as if the artist is capturing an invisible voice, decoding it. Throughout In a Park its somewhat of a reverberating levitating act where the tonal range just continues bending until the ambient noise is reduced to a soft gurgle in the end. In the final stretch Hegurajima shimmers in pitch and subtlety. It’s more like the continuous after-effect of striking a gong than any harp I’ve ever heard. The tone almost has a glare at certain times. Lastly we have Kinshozan which kickstarts with a fairly quiet rattle and reverb. The striations of tone rise up and become bright spots, again an interesting nod to old school sci-fi soundtracks and life beyond our perception. The voice of the wind is striking to consider as a dialect, as Yanagisawa has done here, allowing for its whispers as well as its ranging contortions. Eisuke Yanagisawa shows love for their surroundings with the surreal drones of “Path of the Wind”. Infinitely delicate the way that the pieces evolve seems to go for a meditative, fully immersive sort of scenario. By making sure that these field recordings float further and further away from their origins, Eisuke Yanagisawa makes sure that the whole of the scope works wonders in gradually weaving itself into the mind. Hard to precisely pin down, besides the obvious drone influences and environmental elements Eisuke Yanagisawa utilizes elements of classical into the mix ensuring that everything comes together in a grand stream of consciousness style. Opening up the album and setting the tone for what follows “Ferry Passing” has a high-pitched, uneasy glimmer to it. Nearly metallic at times, the whole of the piece evolves at a deliberate pace. Further embracing the oddity “Seagull” continues to explore aural underbellies, this one somewhat lightened by the sound of the waves crashing against the shore. Near silence rules over the intimate “In a Park”. A static drone radiates over the course of the incredibly subtle “Old Camellia Tree” by far the highlight of the album. Strangely beautiful “Hegurajima” continues along at its own unique pace. With “Kinshozan” Eisuke Yanagisawa brings the entire album to a stunning, oftentimes surprisingly lovely, conclusion, with little snippets of pure bliss hidden amongst the many layers. “Path of the Wind” proves Eisuke Yanagisawa to be a masterful storyteller all without a single word spoken. Get set for some long-haul musical travel with intrepid itinerant Nick Luscombe tonight. Join multidisciplinary artist NSDOS on an Alaskan expedition, where he uses ‘bio-feedback’ to turn data into extraordinary textures and rhythms. And, experience the environmental sounds of the Arctic Tundra through the responsive composition of Derek Charke and the evocative playing of the Kronos Quartet. What means of transport will we use for our journey? Why, the wind of course! Eisuke Yanagisawa channels the airwaves and the weather for his unprocessed field recordings made outdoors in Japan. | Produced by Jack Howson for Reduced Listening. Toneshift: The Future of Music, Today!